Star legacy's Mediterranean Mystic Blue urn is a made of solid brass, individually engraved with a silver/pewter finish and enhanced with a vibrant mystic blue pattern. Sealed with an epoxy clear coat to ensure no scratching. Each urn is handcrafted using a sand casting process that is hundreds of years old. Handcrafting provides each urn with its own unique variation in color, finish and texture -so no two urns are exactly alike. Truly, a one-of-a-kind urn to cherish your loved one. The urn has a screw-top lid for easy handling and is ideal for home, columbarium, scattering, or burial. 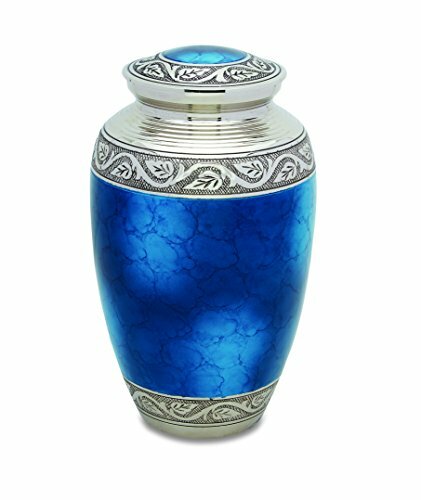 Simply beautiful, the Mediterranean Mystic Blue large/adult urn is a lasting tribute and a Keepsake is available separately. Ships with velvet bag. The large/adult urn holds up to 200 cubic inches of cremated remains (one pound weight prior to cremation equals one cubic inch). Dimensions: Approximately 10”H x 6”W. Due to the personal nature of this product we do not accept returns except for manufacturing defects or shipping damage. NEW handcrafted 100% Brass Metal Cremation Adult Urn for Human Ashes. Star Legacy guarantees we NEVER sell a used product. Dimensions: 5.5 " L x 5.5"W x 10.5 "H. Holds up to 200 cubic inches of remains (one pound weight PRIOR to cremation equals 1 cubic inch). If you have any questions about this product by Star Legacy, contact us by completing and submitting the form below. If you are looking for a specif part number, please include it with your message.